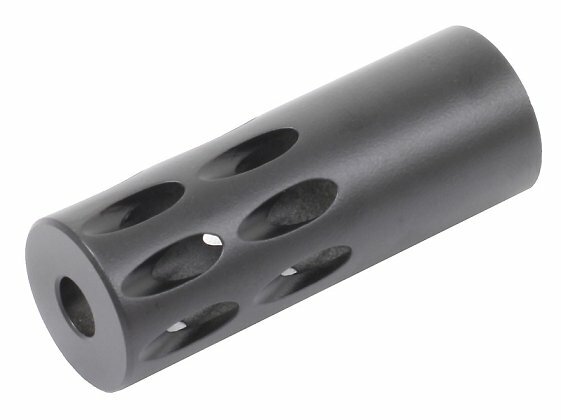 Volquartsen's "Forward Blow" 10/22 Compensator is designed to stabilize the muzzle while directing noise away from the shooter. It has 16 precisely machined ports that are angled in a forward direction. 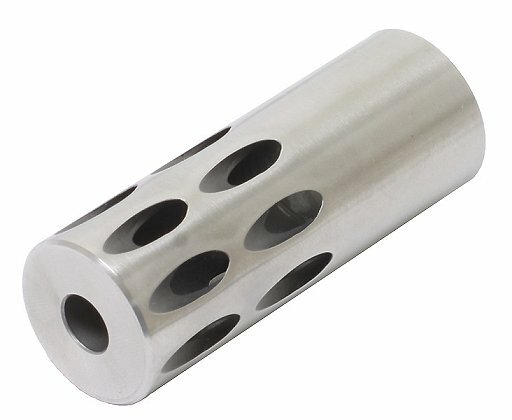 Threaded 1/2" x 28, the Forward Blow Compensator fits our threaded Accuracy Barrels as well as the Tactical Solutions threaded muzzle barrels. The .920" diameter matches your target barrel diameter perfectly. Also available in Light weight Black Aluminum. This Light Weight Aluminum Comp is slightly shorter with the ports slightly off-set from each other. Perfect for the Ultra-lite Barrel configuration. Fit my E.R. Shaw fluted, stainless bull barrel perfectly!! Looks amazing!! !